Orders must be placed separately for the following items since they are from different vendors. Refer to the sizing charts to ensure the apparel fits as expected. Note that ALL SALES ARE FINAL since the apparel is custom made. The web store for jersey, shorts, jackets & accessories is currently closed. The store will reopen April 29 - May 5, 2019. Club apparel is available to order a couple times a year (typically in the fall and spring). The SLBC Quartermaster will announce in the SLBC Weekly Updates when the store is open to place orders. Payments are made online to Voler and orders are shipped directly to you (at no additional cost). Allow 4-6 weeks for delivery after the sales period has ended. Please read below before ordering. All sales are final since the SLBC apparel is custom made. Although the SLBC Peloton DX jerseys are Athletic/Club aka 'Club fit' (in between club and race cuts) select the “Club” cut when placing your order. Since there is no fitting session, it's recommended that you find someone your size to try on their apparel. Otherwise, use the sizing charts (linked below). Jerseys are a little snugger than club cut but looser than race cut. If you are unsure, order the next size up. IMPORTANT… All women's Peloton DX short sleeve, long sleeve, and sleeveless jerseys have no elastic in the waist. Note that this is different than the product description. If you would like to order a sleeveless jersey, you can find it by first clicking on "Peloton DX Jersey" after you begin shopping. Once you select the gender, you will be brought to a page where you can select a "Sleeveless" or "Club" (short sleeve) jersey. The 50+ UPF SolSkin lightweight UV Arm Protectors can be found under the "Warmers" category. These gloves tend to run large. You may want to order one size smaller than you would normally wear. NOTE: Review the sizing charts carefully before placing your order. Since the apparel is custom made all sales are final. SLBC Peloton DX jerseys are Athletic/Club aka 'Club fit'. It is a slightly looser fit than race, but still has elastic in the waist (men's only) and arms to aid with performance and prevent flapping in the wind. The women's jerseys have no elastic in the waist and should lay nicely when riding. The Peloton DX jersey is designed for all-around riding. It is great for training and endurance rides. * The description on the Voler website states that all jerseys come with the silicone gripper. Note that only the men's SLBC jerseys include the gripper. The Peloton DX Short is a great all-around short. The 9 panel design has sweeping leg panels and a rear panel. The web store for t-shirts, polo shirts and hats is closed. See Ordering information below for purchasing items individually. 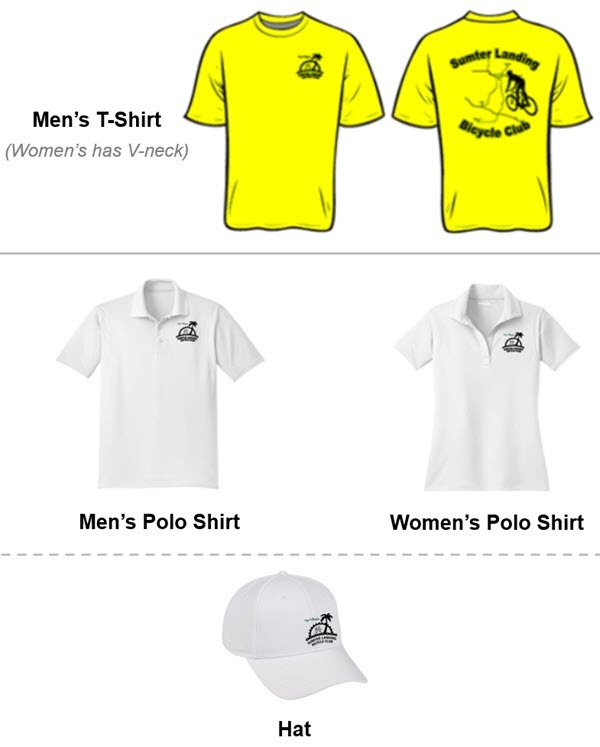 Club t-shirts, polo shirts and hats can be ordered directly from Custom Apparel (3451 Wedgewood Ln, The Villages, FL). Pick out any style shirt or hat that you like. 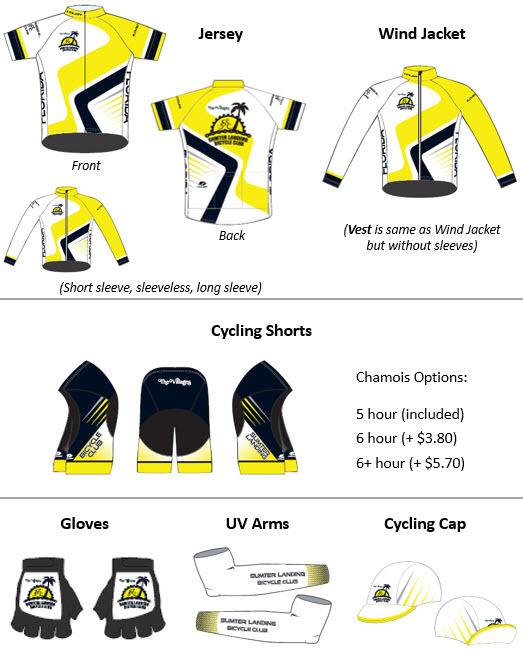 Just tell Custom Apparel you want to have the Sumter Landing Bicycle Club logo put on your merchandise. They have the logo on file.